"A powerful weapon that is difficult to deflect. Capable of dealing a string of critical blows." Speak with Belle in the Library. "Obtained in Hollow Bastion. Features a powerful strike and fast swing." 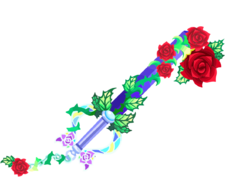 The Divine Rose is a Keychain for Sora's and Player's Keyblades which appears in Kingdom Hearts, Kingdom Hearts Chain of Memories, and Kingdom Hearts χ. In Kingdom Hearts, Belle gives Sora the Divine Rose once he locks Hollow Bastion's Keyhole, and speaks with her at the Library. In Kingdom Hearts Chain of Memories, the Divine Rose is the signature Attack Card for Hollow Bastion. 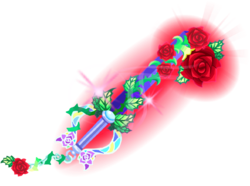 The Divine Rose's design differs depending on its upgrades, most of which are seen in Kingdom Hearts χ. Whenever the Divine Rose hits an opponent, it emits roses. The basic Divine Rose has a periwinkle handguard designed after stained glass. Its handle is dark brown, with the pommel and the base of the blade being dull yellow. 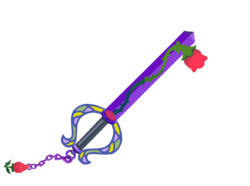 The blade itself is a thin, light violet shaft, with a rose vine wrapping around it and the bud serving as the teeth. The Keychain is sky blue, with the token being a rose bud. The first upgrade gives the guard a more varied color, with violet, yellow, and green patterns. The handle is a darker grey, with the pommel being violet. The blade's base is pink, while the blade takes on a darker violet color. The teeth are a blossoming rose, as is the Keychain token. The Keychain's links are also violet. 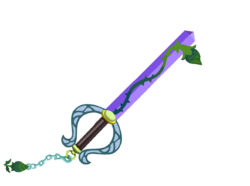 The second upgrade, also seen in Kingdom Hearts, has a golden guard and a brown handle. The rainguard is designed to resemble the thorny leaves of a rose bush. The blade is darker once again, with the rose in the Keychain token and teeth more ornate. The third upgrade takes on a red, yellow, blue, and green handguard. The rose vine and rainguard are more ornate, with the rose on the teeth developing a second rose. The Keychain is golden, with the token brighter. The fourth upgrade adopts a sky-blue handguard. Rose vines are also present on the handguard, with flowers appearing on the rainguard and bottom. 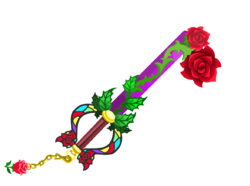 The rose vine on the blade has also engulfed the blade, with four roses on the blade. The Keychain is also a rose vine, with a leaf on the rose flower. The fifth upgrade gives the Keyblade a powerful, swirling red aura. The Divine Rose's Japanese name is a pun on the phrase "Life in Rose". Although the phrase refers to seeing the world through "rose-colored glasses", in this context it is a reference to the fact that the Beast's life is quite literally within his single rose. 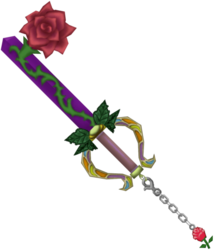 The Keyblade's English name is simply a reference to the magical power of the rose. This page was last edited on 5 April 2019, at 17:02.